Superfan who dares admit he loves Mantovani more than he does his wife! Playing live at Pavilion Bournemouth, The Magic of Mantovani Orchestra and featuring the cream of the crop of the top musicians. So what is the object of his affection? Another woman? A football team? A model train set? No, no, no — nothing so prosaic. For 58 years, Paul has worshipped the music, legacy and life of the late Venice-born conductor, composer and first superstar of easy listening, Annunzio Paolo Mantovani. ‘He is the first thing I think about when I wake up — and the last thing before I sleep,’ Paul tells me in the luxurious cream sitting room of his lavish home in Sandbanks, Poole. 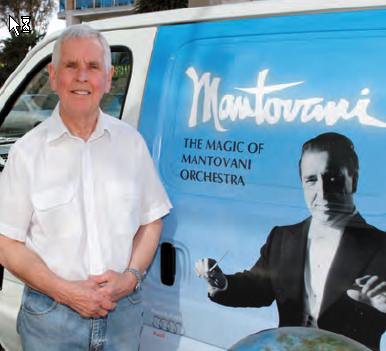 It might be nearly 70 years since Mantovani first wowed the world with his signature sound of ‘cascading strings’ and tunes such as Charmaine and Greensleeves, but Paul has a lot to say about him and talks quickly to fit it all in. 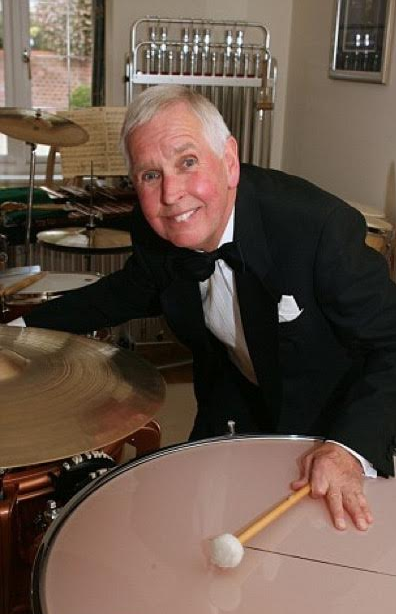 So as well as spending up to ten hours a day playing and listening to the great man’s music, Paul, a talented percussionist himself, has his own his state of the art Mantovani ‘drum room’ where he plays along to his hero’s music. 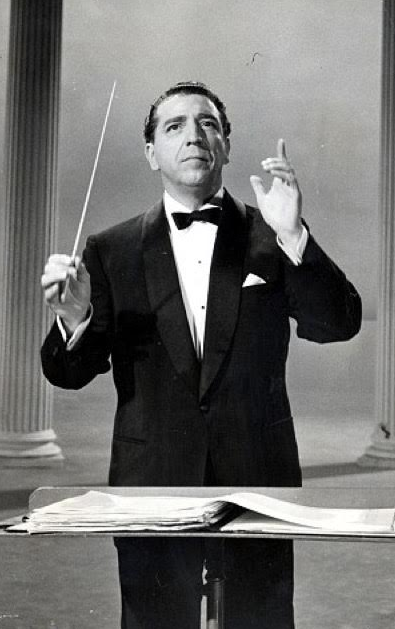 He is also guest speaker on Mantovani-themed Saga holidays and has countless pieces of Mantovani memorabilia, including original instruments from Mantovani’s light orchestra and rights to recordings of a Fifties American TV series that the musician made. But his main mission in life is to bring the music back to the masses. He organises — and pays for — celebratory concerts featuring a 48-strong orchestra and conductor (plus himself on percussion). He records and releases new DVDs of Mantovani’s music and is planning a national tour climaxing in a concert in the Royal Festival Hall in London. ‘It is my life’s commitment. My obsession, my joy,’ says Paul, 70. 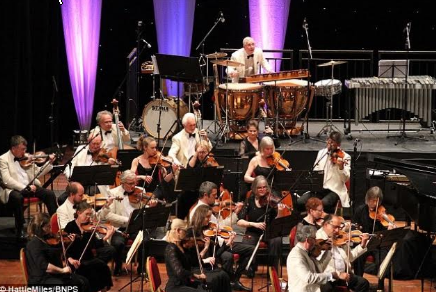 The most recent concert, The Magic Of Mantovani Orchestra, was held last weekend in Bournemouth, cost Paul more than £20,000 to stage and, like the previous seven events, ran at a loss. It did, however, attract more than 1,000 fans, including one man from India, two from Chicago and one from Switzerland. For the benefit of anyone under 60, Mantovani was a fantastically prolific and extremely dashing Anglo-Italian performer who sold 60 million records in the UK and U.S., was the first artist to sell more than a million records and, according to legend, received 700 marriage proposals in one year alone. Paul’s obsession began when he was 12 years old and his father took him to see Mantovani’s orchestra perform at Sheffield City Hall. Paul was already a fan, and when his hero walked on he was beside himself. ‘He was so good-looking and beautiful,’ he recalls. Even better, his father, a professional violinist, took him to meet Charles Botterill, Mantovani’s percussionist, who offered to give him lessons and introduced him to the great conductor after a show. It goes without saying Paul was a rather singular 12-year-old. As well as music, he was also obsessed with photography and had been making his own black and white music documentaries from the age of eight. ‘I was always an oddball because I was so fanatical about things, but I was never bullied because I had a lot of personality,’ he says. Under Botterill’s tutelage he blossomed. 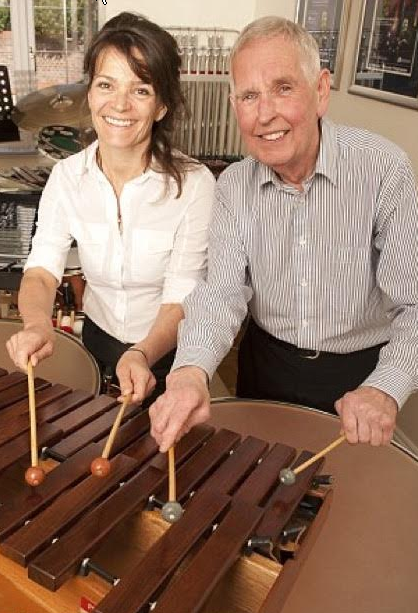 ‘I practised for four hours a day, seven days a week.’ Over the years, he mastered the drums, cymbals, tambourine, triangle, xylophone, glockenspiel and vibraphone, and learned the percussion part for every arrangement of every piece of Mantovani music. ‘I just never stopped practising,’ he says. Not when he joined the family builders’ merchant business when he was 18. Or when he married a dancer called Jenny, when he was 26. He played in orchestras in Sheffield, travelled all over to see the great man and hoped that Botterill would call in sick and he could save the day as understudy. ‘He was an irritatingly healthy man, so I spent my whole life practising but never got a chance to play for Mantovani,’ he says, ruefully. The marriage to Jenny lasted 13 years. Soon after, he met Trish — who prefers the tenor Andrea Bocelli — in a bank queue in Sheffield. ‘Paul was certainly different from anyone else I’d ever met,’ she says. During 2016 The Magic of Mantovani Orchestra entertained a full-house at The Pavilion Bournemouth in the UK. There were special guests and a wonderful selection of Mantovani and his Orchestra favourites.